German Chicken Schnitzel, golden and crispy on the outside, and tender on the inside. It’s ready in about 15 minutes. Chicken schnitzel for breakfast, lunch and dinner? Absolutely! 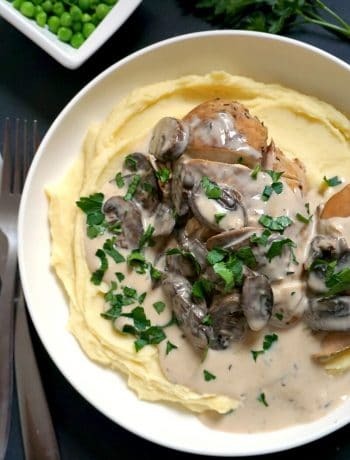 There is no easier and quicker way to cook chicken than this super simple recipe, and it just goes down a treat. Golden and crispy on the outside, and tender on the inside, it hardly needs any seasoning and it tastes beautifully. In a rush in the morning? Just grab two slices of toast and a chicken schnitzel, and you are good to go. 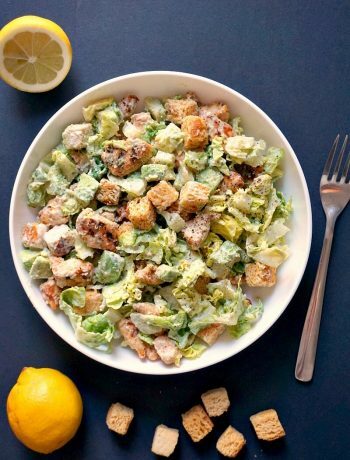 For lunch or dinner you can get as creative as you want, it goes nicely with any salad, vegetable, mashed potatoes, rice, or pulses. I love to have it with garlic sauce, but anything else would do. It might not be the healthiest way, but the traditional way rather. 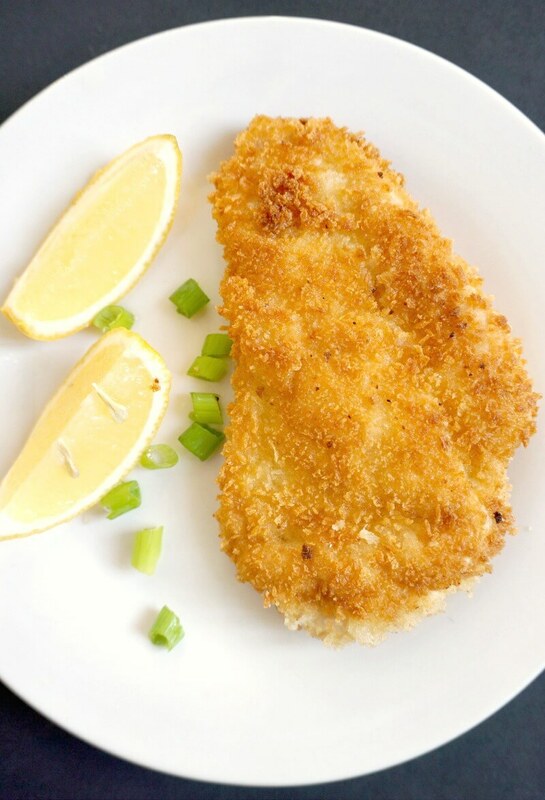 The chicken schnitzel is shallow fried in oil, although you can also bake it in the oven. Once you make it once, you will never go back to those fast-foods to buy chicken meals. Your home-made schnitzel is way better and you know it has 100% chicken meat and nothing else. The secret to making the very best schnitzel is making sure you have a thin piece of chicken, otherwise it will not cook through. So, grab a meat tenderizer, or just a rolling pin, place the chicken between 2 pieces of non-stick paper, and flatten is out as much as you can. The chicken will also be beautifully tender. Once you have the right thickness, coat it with flour, then egg wash, breadcrumbs, and it’s now ready to cook. You can season with the herbs of your choice, if you want a deeper flavour, although the good old pepper and salt work just fine. The chicken schnitzel is a great alternative to the good old chicken kiev. 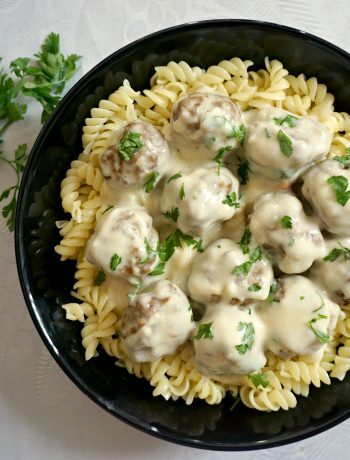 Do give this recipe a try! 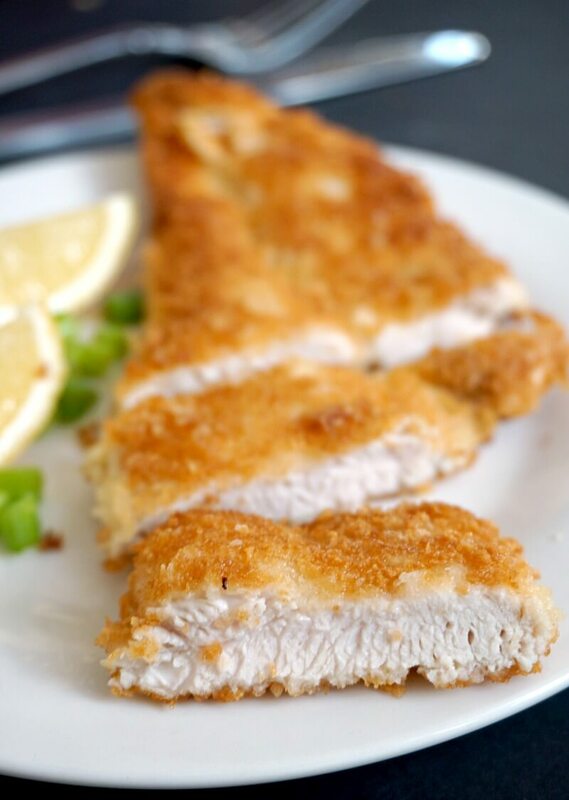 If you’ve liked my GERMAN CHICKEN SCHNITZEL or any other recipe on the blog then don’t forget to rate the recipe and let me know how you got on in the comments below, I love hearing from you! You can also FOLLOW ME on FACEBOOK, and PINTEREST to see more delicious food and what I’m getting up to. 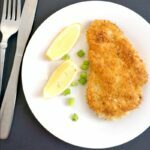 German Chicken Schnitzel, a fantastic recipe that is super easy to make, and sure to please a crowd. Place the chicken breasts on the work surface, cut them in 2 lengthwise, and bash them with a meat tenderiser. We need them as flat as possible, the thinner the slices, the better. It also reduces the cooking time, as they are perfectly cooked really quickly. I used organic chicken breasts, but any good-quality chicken breasts would do. Next, we need 2 large plates. On one plate we have plain flour, on the other breadcrumbs. Beat the egg lightly using a fork, then season with salt and pepper. Coat the chicken slices in flour, then dip in the egg mixture and in the end toss them well in breadcrumbs. Heat up the frying pan and add the sunflower oil. 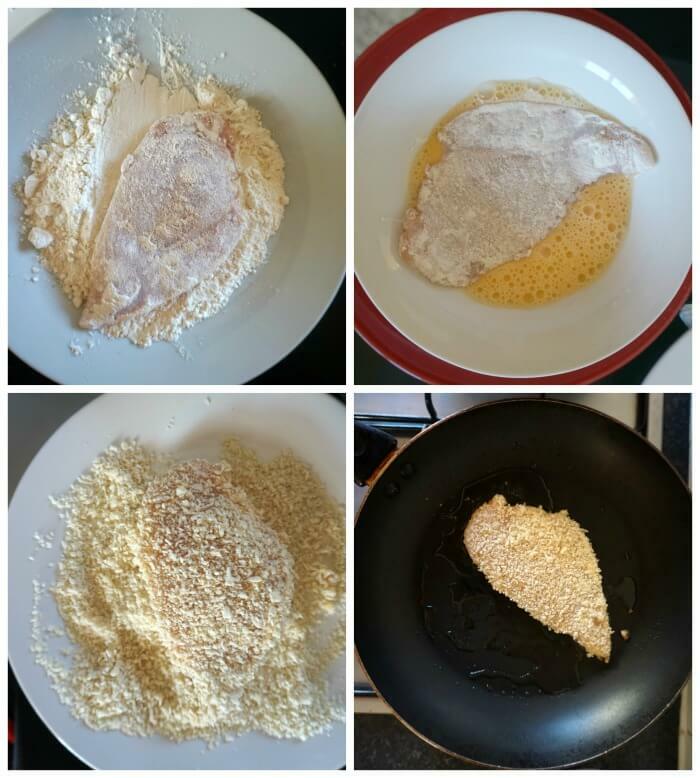 Fry the chicken schnitzels on both sides for about 2 minutes on each side until golden, then remove from the pan and place on a kitchen towel to remove the excess oil. Serve hot or cold with any sauce. The chicken looks so tender and juicy! This looks so good! I love schnitzel, but never thought of doing it using chicken! thanks for what I know will be a great recie! Thank you, Sharon! I’m sure you’ll love the chicken schnitzel too.